We are delighted to announce that our website has made it to the top four in Pavement Maintenance & Reconstruction’s 2018 Awards! Our website beat out hundreds of competitors for the Best of the Web Award, which recognizes the paving website that is most attractive, engaging, and easy to use. Our website is an outstanding example where aesthetics meet usability. With our new website, we have seen a large growth in our online presence, increasing traffic and generating online leads. We even experienced the creation of a major project two months after the launching of the new site. Everything has been achieved without the need for advertising, all of it is organic traffic. And leads keep coming in! We couldn’t achieve any of this without the amazing team at Boral Agency. We chose them to handle our entire rebranding and revamp of our website. Our new logo is modern, clean, and incorporates our commitment to the environment. Our new website showcases a beautiful design that is visually appealing and easy to navigate, displaying our work and projects to help our customers and visitors know us better. We hope you like it! They did a terrific job that paid off significantly, and now we’re award finalists. You can cast your vote here using any device. The winner will be announced at the National Pavement Expo on Feb. 7-10 in Cleveland, Ohio. 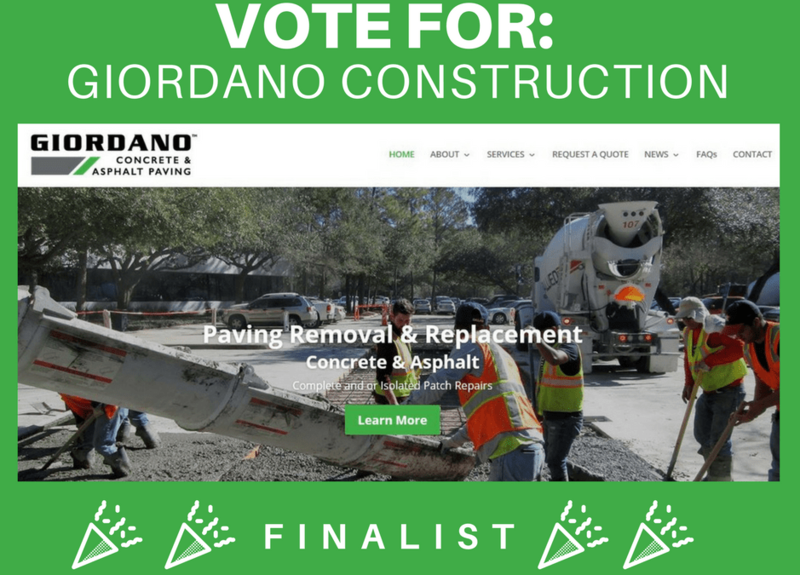 Why vote for Giordano Construction Inc.? We know our success depends on how we satisfy the needs of our customers, which is why we always strive to be the best version of ourselves. “Their responsiveness, professionalism, workmanship, and the attention that the owner gives to each project are superb…” This is just one of many testimonials that we have received during the past 20 years of experience in the concrete and asphalt paving industry. Recycle over 90% of Removed Concrete, Asphalt, and Base Materials. Top 50 Contractor for 3 years – Pavement Maintenance & Reconstruction Magazine. 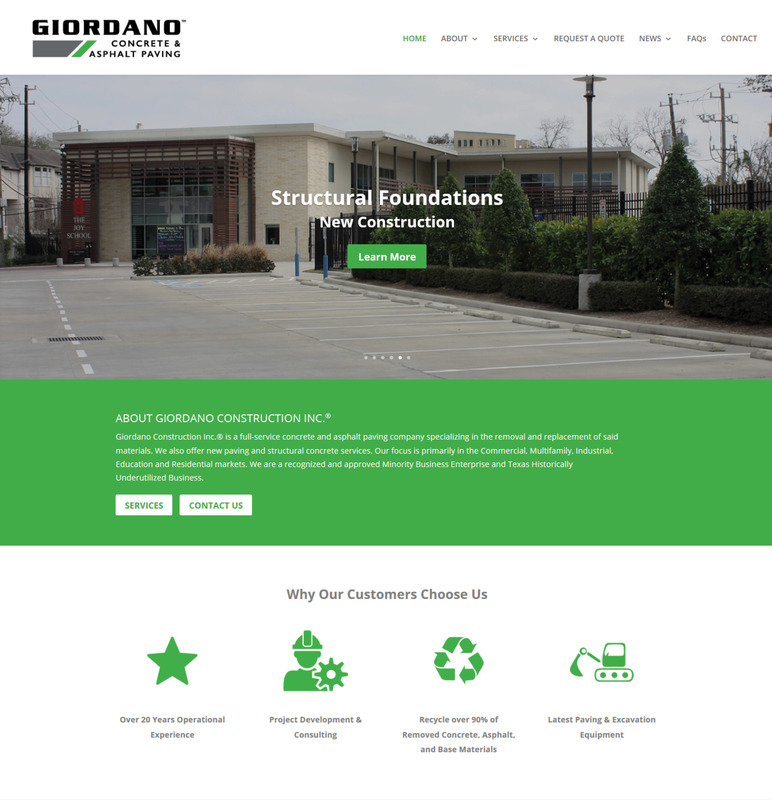 Additionally, Giordano Construction Inc. is a BBB A+ Accredited Business since 2002, Minority Business Enterprise (MBE), Texas HUB, OSHA 10 and 30 certified, and a member of various trade organizations including the Houston Apartment Association and Better Business Bureau. We would greatly appreciate your vote! Thank you in advance for your votes and continued support of our company!